As businesses rethink their IT infrastructures, vendors are looking to software and open source solutions. Find out which are on the forefront. Enterprise infrastructure is going through one of the most dramatic periods of change in the history of computing. The rise of digital business, open source technologies, and services-based IT is changing the game for everyone, requiring IT organizations and professionals to adapt the way they implement and operate technology. Businesses have recognized the power of technology and are using it to transform -- building new products and services, enabling new employee processes, and analyzing customer data better than ever before. That means IT must move quickly to respond to business goals and demands. But old-school, legacy architectures can't measure up, forcing IT organizations to look to new solutions. IDC's 2016 FutureScape study predicted that by 2018, 70% of the spend on infrastructure will be related to this digital transformation. The need for increased speed and increased capabilities also shifts toward a new breed of infrastructure and away from the old mentality in which IT pros simply maintained existing systems. By 2018, the goal of 50% of infrastructure investments will be to "foster greater engagement, insight and action," according to IDC. Additionally, the firm predicted that 45% of the installed base of infrastructure will be using automation and autonomy to improve performance, lower costs, and provide the agility and scalability businesses will require. The shift to a results-driven IT model means big changes for infrastructure. While traditional gear such as dedicated servers, storage arrays and switches remain core elements of many environments, IT organizations are leveraging system software, automating processes, adopting open source technologies, and implementing a wide range of cloud-based applications, platforms and services. Software is so pervasive that many of the companies selling today's "infrastructure" are pure software vendors. This shift opens the door for technology providers to deliver a wide range of new solutions and products more quickly and easily. Instead of having to develop and manufacture a box or appliance, they can roll out a software product or SaaS application that addresses specific market challenges or demands from customers. Customers are also looking for improved interoperability and products based on open standards. In response, vendors are joining forces and creating alliances with each other and with organizations like the Linux Foundation. When it comes to actually integrating open source technologies, some vendors commit to the ideals and development of open source and simply offer support. But it is more common for providers to roll out semi-open options that are based on open source, but incorporate proprietary software and tools. Data centers are evolving to adapt to demands for agile and scalable IT. While a large portion of corporate data may be shifting to reside outside the enterprise – 451 Research predicts 50% of corporate data will be hosted in the cloud by 2018 – managing workloads effectively both internally and externally is crucial. And a company's on-premises architecture must be more sophisticated than ever. The widespread use of virtualization has proven that infrastructure can be successfully abstracted into software, leading to software-defined IT of all types. Hypervisors have become commonplace and are giving way to containers technology, which provides a more efficient and portable way to virtualize applications. New products and vendors are bursting onto the scene to support, manage and secure Docker and other container technologies. Networking technology has risen to the forefront as virtual networks and open source options stand ready to replace legacy hardware. Software-defined networking (SDN) and network functions virtualization (NFV) promise to allow networks to move as quickly and flexibly as their as the applications and processes they must transport, with far greater visibility and control. More importantly, they will enable automation of functions such as prioritizing traffic, adjusting capacity depending on demand, and proactively responding to outages and bottlenecks. Although full-fledged adoption of SDN is still on the horizon, many IT organizations are experimenting with and finding success with SDN over the wide area network (or SD-WAN). And the ability to abstract network software from the underlying hardware has given rise to white-box and bare-metal options in which networking software, generally open-source, can be installed on commodity hardware. Storage infrastructure is also experiencing growing pains, spurred by the rise of big data and the demand for real-time information and data analysis. Legacy storage arrays and storage area networks are no match for the new demands, and IT organizations are replacing them with new flash and solid state products, leading to dramatic consolidation in the market. At the same time, flash prices have fallen, making the technology affordable and accessible for those drowning in data. The ability to separate functionality from hardware is making a mark on the storage industry as well, offering server-based storage and ushering in software-defined storage (SDS). The disruption in the storage industry and never-ending demands have led to impressive developments, especially in terms of unstructured data awareness and storage performance for virtual environments. Hyperconverged systems grew out of innovations taking place in the storage market. While converged infrastructure provided pre-engineered servers, storage and networking and united them under a single management console, it still relied on a rack of traditional hardware components. Hyperconverged infrastructure provides much of the same functionality, but is housed in a single box and based on a hypervisor-centric architecture that allows for greater flexibility. A key differentiator is the ability to provide all compute and storage functions through the same server-based, virtualized resources. Hyperconverged systems contain modular components combined in an appliance for easy installation and management. Additional nodes can be added and managed with a distributed operating system and scale-out storage via software, making hyperconvergence a popular choice for businesses with rapidly expanding storage needs. These emerging capabilities mean exciting times in the industry, with the infrastructure market experiencing renewed vitality. Speaking at Interop 2016, Martin Casado, general partner at Andreessen Horowitz, said that we are about to enter a new era in infrastructure. "Traditional infrastructure is going through a shift, but we're on the cusp of something much bigger, badder, and much more innovative," he said. "We're actually entering a golden era of infrastructure." As enterprises adapt to digital business and focus on enabling revenue-generating business, their technology suppliers are adapting, too. Traditional hardware vendors are embracing software and service-based options, and startups offer a host of innovative alternatives. Which vendors are worth your time to investigate if you're charged with building or managing IT infrastructure? We've selected 25 hot companies to keep on your radar. A10 Networks (@A10Networks) originally sold load balancers, but is expanding its capabilities to address application performance and security across clouds and data centers. Barefoot Networks (@barefootnetwork), led by Stanford University's Nick McKeown, has developed a super-fast switch chip that provides granular programmability for networks. Big Switch Networks (@bigswitch) offers a bare-metal switching fabric and SDN control software, primarily targeted at data center networks. Cambium Networks (@cambiumnetworks) provides wireless broadband and backhaul to enable the Internet of Things and industrial internet applications in challenging locations. Cisco (@Cisco) is a networking industry stalwart that has remained exceedingly popular by predicting future trends and focusing on developments like SDN and security. CloudGenix (@CloudGenix) provides a software-defined WAN platform that builds a centralized control plane for WAN assets, allowing administrators to identify and prioritize specific application traffic. CoreOS (@coreoslinux) provides its own Linux distribution and Kubernetes container management stack along with a management console to enable large deployments on varied infrastructure. Cumulus Networks (@CumulusNetworks) provides a Linux-based network operating system for white-box switches. Docker (@docker) is at the center of the container craze, providing open-source tools that automate the deployment of applications in software containers and make it easier to manage container deployments. ExtraHop (@ExtraHop) sells an appliance that analyzes network data across the infrastructure to give visibility into application performance, availability, and security. Mist (@MistSystems) offers next-generation wireless technology that combines cloud-managed WiFi, analytics, SDN, and beaconless location-based services. Nimble Storage (@NimbleStorage) offers a portfolio of flash arrays and hybrid arrays along with a management platform that predicts issues to ensure optimal performance. Nutanix (@nutanix) provides integrated compute and storage through servers running standard hypervisor and the company's hyperconverged operating system. Pluribus Networks (@Pluribusnet) offers a Linux-based SDN platform with the ability to gather real-time analytics and monitoring information. Pure Storage (@PureStorage) provides flash-based storage to accelerate applications like server virtualization, desktop virtualization, database systems and cloud computing that require very high performance. SimpliVity (@SimplVityCorp) offers a hyperconverged platform that combines compute, hypervisor, storage services and network switching on x86 server hardware with centralized management. NetApp SolidFire (@solidfire) provides all-flash storage arrays, particularly targeted for those with next-generation cloud and big data workloads. Rubrik (@rubrikInc) offers an integrated backup appliance intended to simplify complex backup infrastructures across clouds with policy-based management and storage tiering. StorageOS (@Storage_OS) offers container-based software that facilitates the development, testing and deployment of containerized applications with enterprise-class storage. SwiftStack (@SwiftStack) sells a commercial distribution of the open source OpenStack Swift object storage platform designed for private clouds. Teridion (@TeridionNet) is focused on optimizing the delivery of content from clouds using SDN technologies to improve the end user’s quality of experience. Veeam Software (@veeam) provides backup, disaster recovery and virtualization management software for virtual environments. VeloCloud (@VeloCloud) provides a software-defined WAN edge architecture that integrates with leading cloud services and SaaS applications. Viptela (@Viptela) sells software-defined WAN solutions that include edge routers and control software to create an encrypted overlay network. VMware (@VMware) has solidified its place in infrastructure through its hypervisor and cloud platforms and expanding into virtual networks and storage. 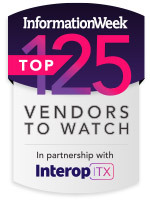 This article is part of the 125 Vendors To Watch series, presented by Interop ITX and InformationWeek.